Nantwich currently has around 20 pubs, which is quite a few considering it’s a relatively small market town. You may be surprised to know that over the years we’ve found 118 different pub names in Nantwich, – and some pub names like the Red Lion have been used on more than one occasion at different premises. 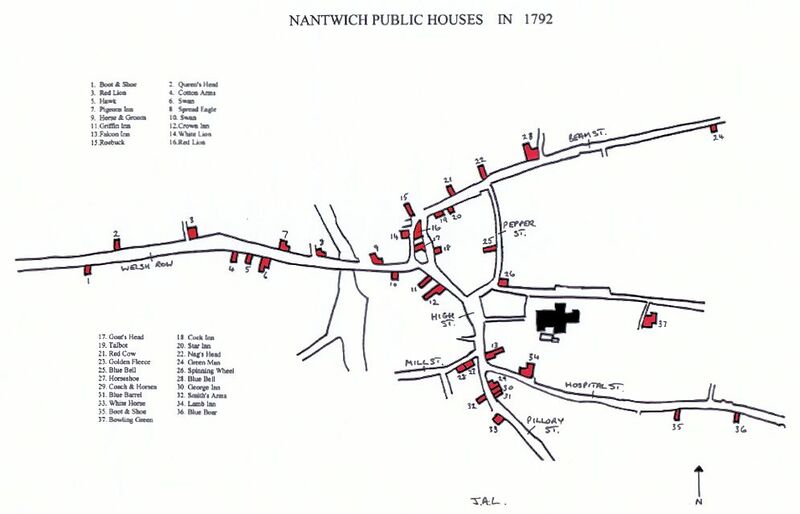 The number of pubs in Nantwich reached a peak in Victorian times. Dr A J Macgregor wrote a book called “Inns and Innkeepers of Nantwich” in 1992, but this is sadly out of print. The book contains some inaccuracies (and no pictures), so I’m writing a book on Nantwich pubs with local historian Andrew Lamberton (who’s already written some superb books on the history of Nantwich). The purpose of this page is to whet your appetite (sorry about the pun) for the book, which is for sale in Nantwich museum and a few other outlets in the town. 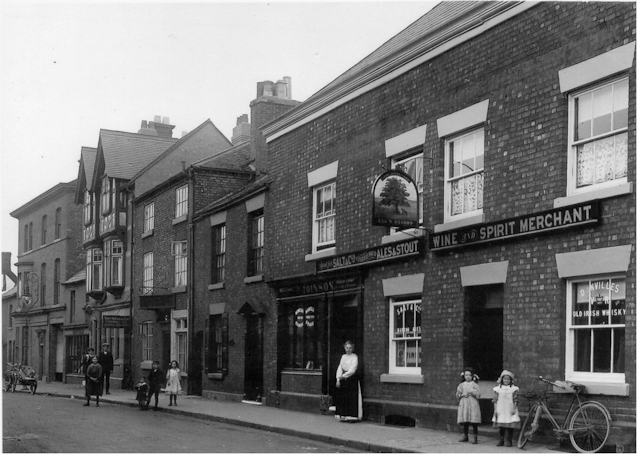 Arsenic in Beer – an Nantwich publican gets fined for selling beer containing arsenic! How many pubs has Nantwich had? – probably more than you think! Nantwich Brewers – Nantwich had its own breweries! The Globe – I’ve been all around the globe researching pubs! The Market Tavern – where there’s a bit of an atmosphere! The Temperance Movement – not everyone was a drinker! The Railway, Crown and Wickstead too. The Wilbraham Arms is there also. The White Swan and The White Horse meet. The Red Cow and The Malbank’s near. The Talbot Inn could be their target. Three Pigeons and, The Bowling Green. Is The Lamb still on the scene? their beer is much preferred to wine? exist for dry Salt City men. a `tight` and cheery band are they! The ROYAL OAK was the first pub I ever went in in 1971 when I first came to Nantwich !,Tom Meredith the undertaker (with whom I later lodged) took me in there. Ha.. That was also the pub I first walked into on a Christmas eve in 1980 (I think). As I was leaving I got head butted for no reason whatsoever! I just thought “Is this what all pubs are like then”. Shortly after it closed. I’m guessing it closed in 1981. I used to live in the back lion on Welsh row. And there were definitely ghosts. I was about 8 years old and would talk to “Charlie” all the time. There’s also a hidden priest hole in the top floor bathroom. Thankyou for this information .I will shortly be visiting Nantwich and staying at The Crown in the square ..I intend to call in a lot of the pubs with a historical interest .. Most of these dates come from MacGregor and some are approximate. It’s featured in our Nantwich Pubs book (pages 121 – 123). There’s a picture showing the Bulls Head and the Leopard, and another nice one inside. It was only a small pub – there’s an interesting description in the Nantwich Tavern Survey, which Nantwich museum will publish soon. The Swan with Two Necks, featured on page 23 of “Nantwich Pubs”, shows John Dunning as proprietor. During 1966, I worked in Sandbach where the Landlord of the Military Arms was also a Mr Dunning who was the brother my boss, Reginald Dunning, Rating Officer. Is there a connection here please? The Dunnings appear to have been regular Pub owners in Sandbach history. Charles Dunning had the Double Neck from 1871-83 and John was there in 1887-88. There was a Charles Dunning at the Cotton Arms (on Welsh Row) in 1857-69, he could be the same person. There was an Elizabeth Dunning at the Queen’s Head (on Welsh Row) in 1888-93. In 1910 a Charles Dunning had a shop on Arnold Street. I wouldn’t know if they are connected to the Sandbach ones -but if you go to the library and check Ancestry, Find My Past and the Trade Directories you should be able to find out more. I have seen a photograph of a building called “The Town Hall Restaurant”. Situated at about the position of Harrison’s Café Bar. The postcard caption states that this building was once called The Market Tavern. Can this be confirmed please? I’d be interested to see that Lindsay. The Old Town Hall was where Harrison’s Café Bar is – but the Market Tavern was on Market Street (near where the bus station now is) so the caption doesn’t seem correct!